“Elias’s CD (Kicks) is very much in the Jazz group concept of today. It is obvious he has spent the time to reach a level of excellence that is commendable." 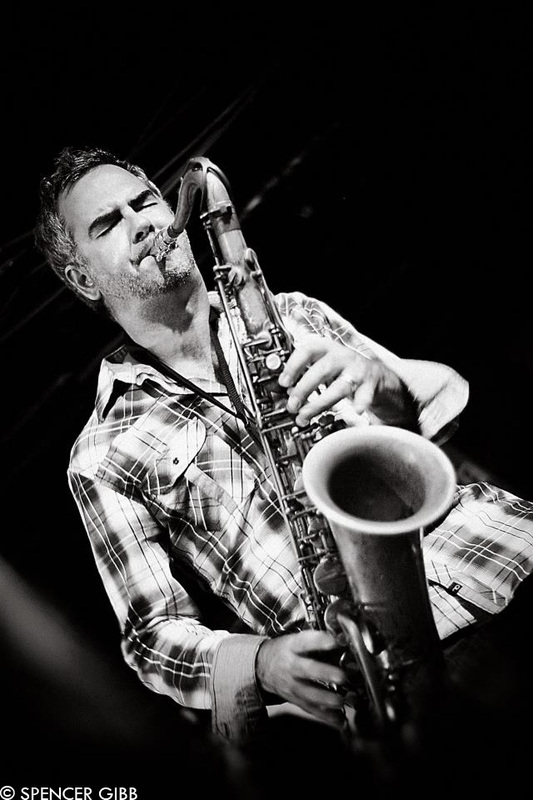 Since returning to his hometown of Austin in 2004, Elias has kept an active performing and recording schedule, including founding the label, Cherrywood Records, releasing the 2006 recording Dream Story and performing weekly engagements in Austin, Dallas, Houston, San Antonio, and New Orleans. In September of 2012, Elias released his award-winning CD entitled Church on Monday which spent 11 weeks on the JazzWeek national radio charts and was distributed across Europe, Japan, the United States and Europe. As a result of the success of the CD, which features Texas music legend Dr. James Polk, Elias and his band, now called Church on Monday, established a weekly residency at Austin's famous Continental Club Gallery where they regularly play to standing room only audiences. The recording garnered many favorable reviews and helped the band win Best Jazz Band from the Austin Chronicle as part of the Austin Music Awards for 2012-2013. 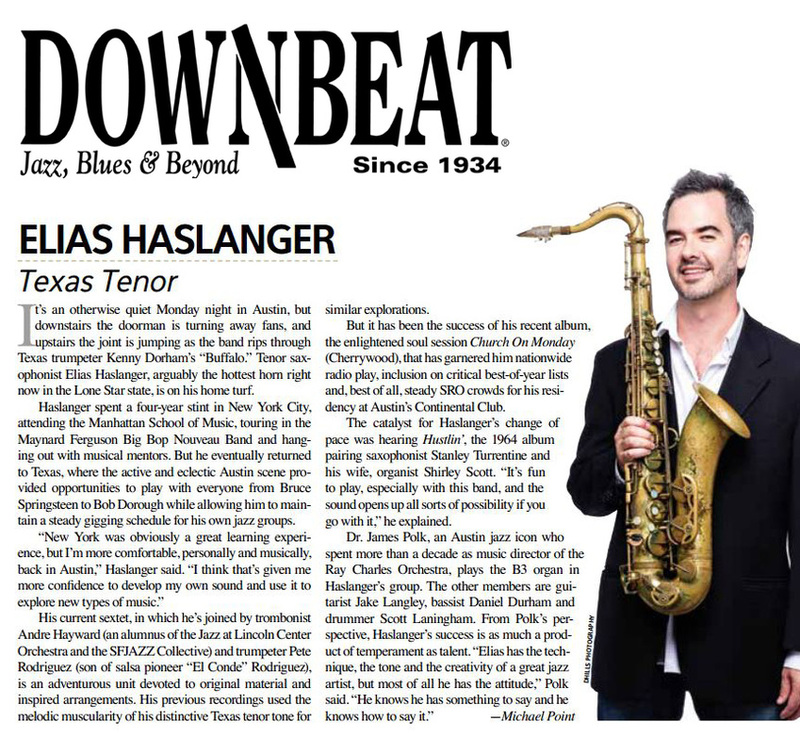 Downbeat magazine also has featured Elias and the band in its June 2013 issue. In February of 2013, Elias was short-listed by the Texas Commission on the Arts for the role of State Musician of Texas. This prestigious position has previously been awarded to Lyle Lovett, Ray Benson and Willie Nelson and is a reflection of Elias’s hard work and dedication to advancing the arts in Texas. At the beginning of 2014, Elias and Church on Monday were featured as part of Alejandro Escovedo's United Sounds of Austin. A sweeping show that celebrated the rich history of Austin music, Elias and the band received a standing ovation at Austin's Moody Theater and they were described as "bringing down the house" in the Rolling Stone article that reviewed the show. Elias continues to collaborate with the legendary singer/songwriter including shows at the Cactus Cafe and SXSW. In April 2014, Black Fret, Austin's non-profit organization dedicated to advancing the arts, named Elias and Church on Monday as one of its inaugural nominees to be considered for a $10,000 grant. Black Fret's mission is to help Austin musicians achieve their goals by offering mentoring and a cash award that artists can apply to recording, promotion, or any activity the artist feels will best help the advance their career. In May of 2014, Elias celebrated the release of his 6th CD as a leader, 2014's LIVE at the Gallery, which showcases Texas jazz icon Dr. James Polk, the former musical director for Ray Charles, and guitar virtuoso Jake Langley, former band member of Bobby Blue Bland and Joey DeFrancesco, among many others. 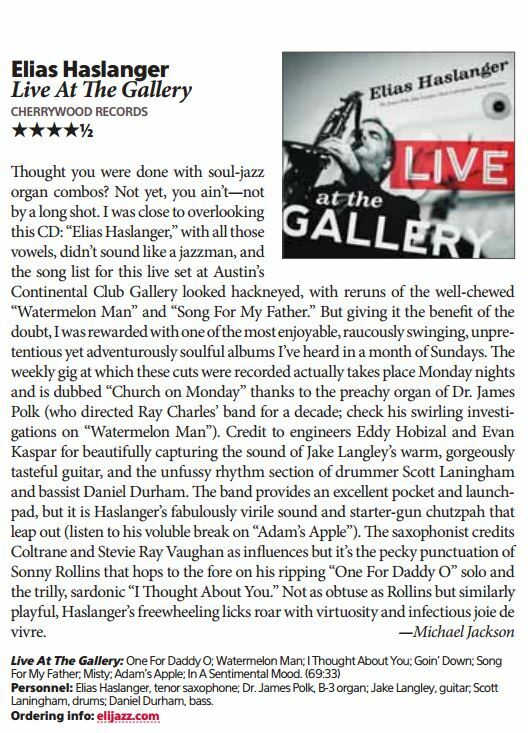 Says Michael Jackson in the June 2014 issue of DownBeat magazine, "[LIVE] is one of the most enjoyable, raucously swinging, unpretentious yet adventurously soulful albums I've heard in a month of Sundays... Haslanger's freewheeling licks roar with virtuosity and infectious joie de vivre. 4 1/2 stars"
LIVE at the Gallery spent 12-weeks in rotation on radio stations around the United States and Canada, climbing as high as #14 during its run on the JazzWeek national radio charts and continues receive positive reviews from writers and fans across the globe. Just recently, the CD was accepted by NARAS to be considered for a GRAMMY nomination for 2015. In summer of 2014, Elias was invited to perform with Sheryl Crow, Doyle Bramhall II and Grupo Fantasma for Austin City Limits 40th Anniversary Show. Taped in July, the show aired in October of 2014 and celebrates the history of the highly regarded, longest running music program on televsion. Elias embeds the best of classical influences–from Ricard Strauss to Sergei Rachmaninoff; of rock and pop legends–from Nat King Cole to the Beatles; of the profound and powerful heritages of jazz greats–Duke Ellington to John Coltrane.